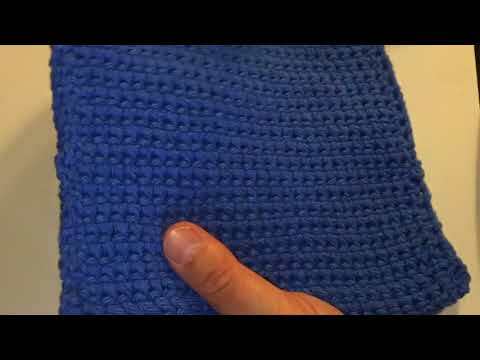 When I completed my first crocheted thick hot pad, I was in love with this stitch. This hot pad is flexible, yet it is thick enough to protect your hands and counters from burns. 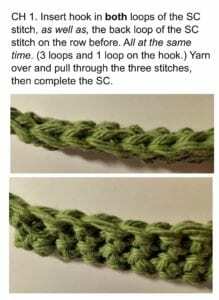 Achieving this thick crochet stitch is easy to do with a little practice. 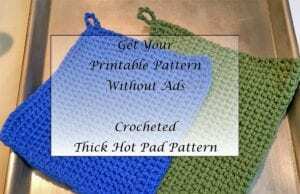 This crocheted thick hot pad is ideal for craft sales. I have often seen this and wanted to make one. However, it was hard to find one place that had good directions. Therefore, I looked at a few of them and was able to figure this out. In an effort to help provide clear directions for you to make one yourself too. Some people can learn from the written directions along and others like me, need photos and a video sometimes. 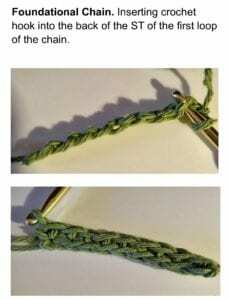 I have included a picture tutorial below along with a video showing the crochet stitches being done as well. After making the first hot pad, I started to do some research on the various types of stitches used for creating a thick hot pad. I noticed some people called this stitch the thermal stitch. This is a double thick no-burn hot pad. While I used this stitch for my hot pads, it would be ideal for a washcloth or any other project where you wanted a bit thicker crochet stitch and stability. I could see this stitch used to make a clutch. HUM…might have to give that a try someday. 1 skein approximately 100 yards of cotton yarn. Row 1: SC in the back of the ST of the first loop on the 2nd foundational CH from the hook. Complete this process of SC in each CH across. Row 2: CH 1. 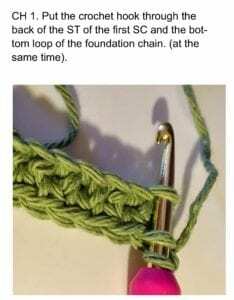 Put the crochet hook through the back of the ST of the first SC and the bottom loop of the foundation chain. (at the same time). 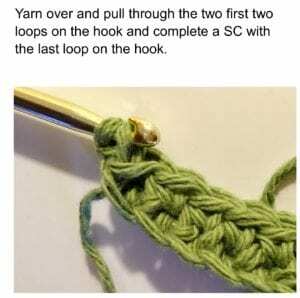 Yarn over and pull through the two first two loops on the hook and complete a SC with the last loop on the hook. Complete this process for each ST across. Make sure to go right to the end for nice even side seam as this last stitch is crucial in keeping the work square – you may want to count the stitches to make sure that you have completed 30 SC. Row 3-25: Continue row 2. You can make this hot pad larger or smaller by adjusting the number of chains in the foundational row or adding on rows to the work. Final row: CH 1. Insert hook in both loops of the SC stitch, as well as, the back loop of the SC stitch on the row before. All at the same time. (3 loops and 1 loop on the hook.) Yarn over and pull through the three stitches, then complete the SC. Continue this in each SC through to the last ST. (If you want to add a hanging loop, do not fasten off at this point. If you do not want a hanging loop, go ahead and cut off the yarn leaving a 10-inch tail. Weave in ends and cut off the excess yarn). Make the hanging loop: CH 8. Work a SC in the last SC. Cut off yarn leaving a 10-inch tail. Weave in ends and cut off the excess yarn. As you continue to complete rows, you will notice that each row lays halfway across the previous row. 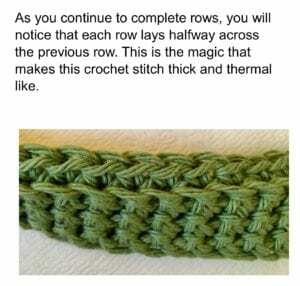 This is the magic that makes this crochet stitch thick and thermal like. As I mentioned earlier, make sure to pick up the last stitch in each row. Sometimes it can be small and tight and difficult to see. At times, I even have to pull the stitch out a bit to get it. If your hot pad is not squaring up, it could be that you are not picking up the last stitch. Count the SC if you need to as this can help make sure that you are getting all the stitches. 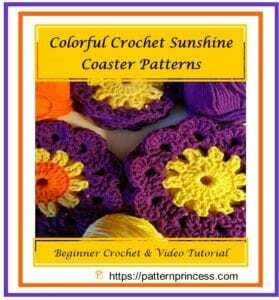 If you would like to be notified of new crochet pattern tutorials that are posted on You Tube, please make sure to subscribe to my channel. Thank you. 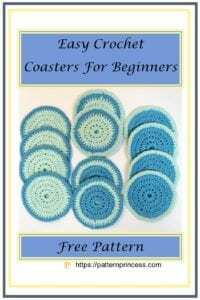 Here are a few other free crochet patterns you might enjoy making.